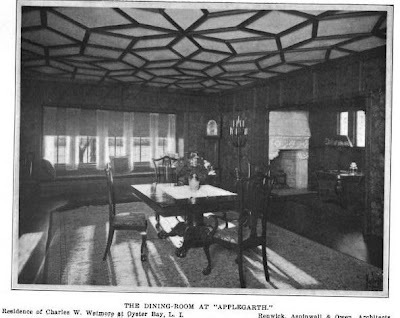 Interiors to Charles Whitman Wetmore's estate 'Applegarth', designed by Renwick, Aspinwall & Owen c. 1892 on Centre Island. 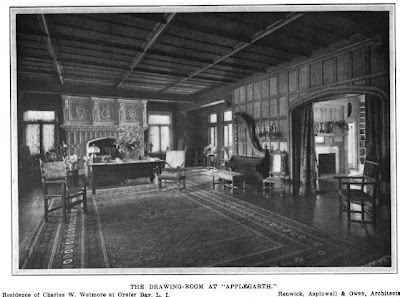 Click HERE for more on 'Applegarth'. Odd. It seems as though the stairs in the photo dont match the stairs on the plan. A redesign maybe? 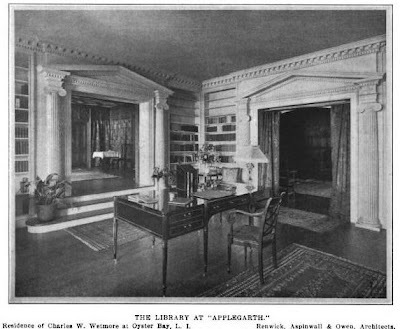 Fantastic georgian revival library. The scale and clarity of those two over sized pedimented openings with a simple background of plain bookcases is a great combination. I have a brochure from when the house was for sale that has a ground floor plan showing the stairs as they look in the pictures from yesterday. Must have been a redesign. Brochure will be posted eventually. OMG - OMG - OMG - where i live here in fantasyland, they carefully removed all those amazing mantles and all that incredible woodwork piece by piece and reinstalled in somebody's mansion that is still extant but i know they probably reduced it to matchsticks and lit their campfire with it and then ground up that fireplace and filled their kids sandbox with it. 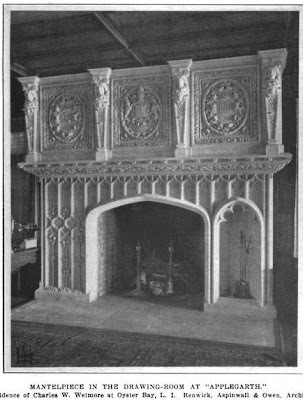 there are some spectacular mantles out there, but this one and those pedimented arches in the library are top notch. do you know what the mantle was made of or where it came from? eg which medieval church in France they took it out of. 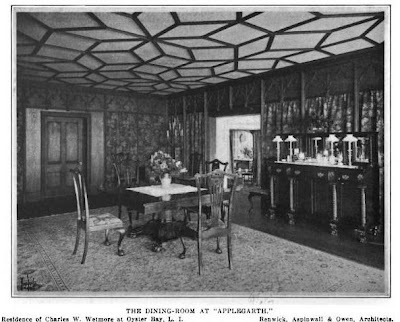 and that ceiling in the dining room - i want one like that. more eclectic houses like this and shoremonde are my faves - keep em coming. 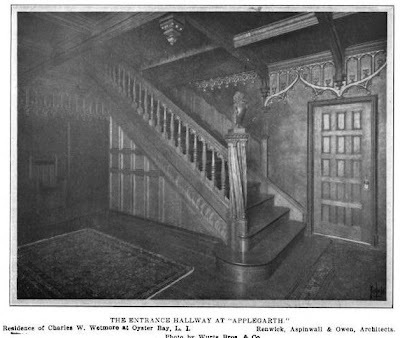 oh, yeah - forgot to mention that twisted newel post on the stairs- that must have been a bear to make and sooo interesting. i suppose this is the unanswerable question but the house they built on the site of applegarth isn't exactly an outhouse so if they were going to put up something on the scale of what they tore down, why not just sell the house and subdivide the land. i mean, the stick one on the boat basin just up the way from applegarth is actually bigger. i guess its my time-shift waste not -want not if it ain't broke -don't fix it maine thinking. excuuuuuuuse me! The brochure was put out by PCA with a 23rd street adress. They moved there in April 1935. Francis Nichols (son of Wm) was owner along with the Hanover Bank on the 1938 property card. So the brochure is likely from the late 30's. Francis Nichols had built his own estate, Bayberry Downs, in Muttontown in 1930. 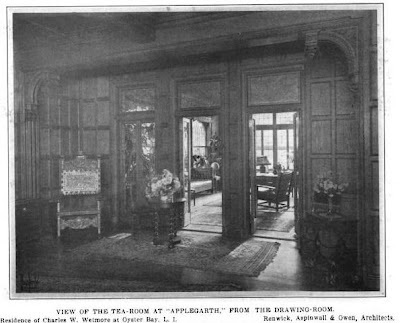 But even for the wealthy taxes were a killer then as now so perhaps unable to find a buyer for Applegarth it may have been torn down to reduce the taxes.